Lowery, Mike. Very Good. Who Cut the Cheese? (Doctor Proctor's Fart Powder) by Nesbo, Jo. Trade paperback (US). Glued binding. 458 p. Contains: Illustrations, black & white. Doctor Proctor's Fart Powder. Intended for a juvenile audience. Lowery, Mike. Very Good. Who Cut the Cheese? 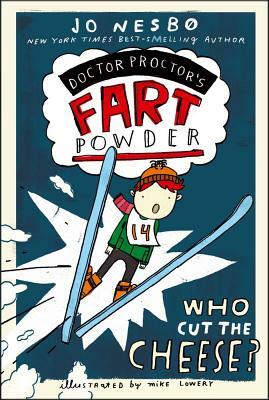 (Doctor Proctor's Fart Powder) by Nesbo, Jo. Glued binding. Paper over boards. With dust jacket. 458 p. Contains: Illustrations, black & white. Doctor Proctor's Fart Powder. Intended for a juvenile audience. Lowery, Mike. Good. Who Cut the Cheese? (Doctor Proctor's Fart Powder) by Nesbo, Jo. Trade paperback (US). Glued binding. 458 p. Contains: Illustrations, black & white. Doctor Proctor's Fart Powder. Intended for a juvenile audience. All Editions of Who Cut the Cheese? This review is about the seller not the book it self. I will post another review when my son is done reading it as we just received this book. The book was listed as *new*. when I received the book there were not any scratches, but the seller did not include a receipt/invoice for the purchased product and across the top and the side of the pages is a large thick UGLY blue line from a sharpie marker. I feel one small mark would have been sufficient but this looks horrible. will not buy from the seller again.